When you’re looking for a new game, what are you looking for? Well, something not too complex, right? A game you can pick up, play for seconds, to minutes, to an hour or more. Or just seconds. Whatever….you just want to pick it up when you have time, play, and then put it down; without penalty. But it has to be fun, of course! What good is a game if it’s not at least enjoyable, right? And the fun should border on addicting. There’s plenty of “fun” games that most people will only play a time or two, before being forgotten until the inevitable deletion. the game needs to grab you, and make you want to try it “just one more time” before putting it back down. Well I’ve found such a game, it’s called Dune!, from the Developer Voodoo. Dune! is a family-friendly casual mobile rhythm game (True story: my 12-year old boys put me on this game; said they were addicted to it). It’s extreme simplicity, clean visuals, and even more extreme replay-ability make it worth sharing here for your consideration. Setup is simple enough; just download from the Play Store and open the game. Behold, the entirety of your tutorial. 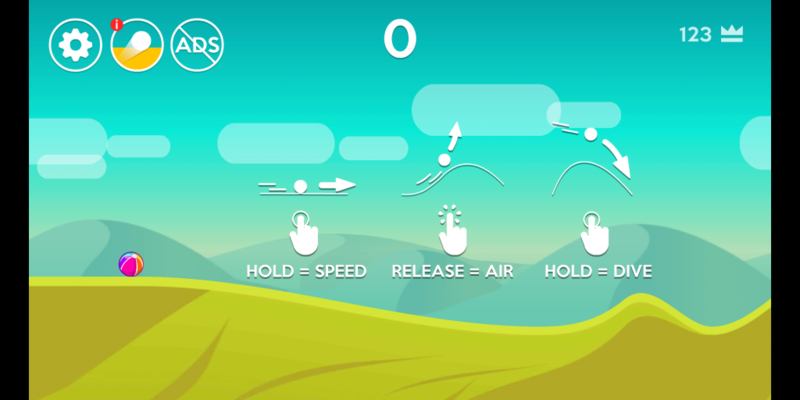 Upon entering Dune!, you are greeted with your overall ‘tutorial’; which amounts to a single screen with all your control instructions: press your screen to accelerate (while on the ground), release at the end of the ramps to get air, and then hold once again (while in the air) to dive back to earth. Then off you go! This of course is the heart of it all. And this is where Dune! shines. The objective of the game is super simple: You are to launch your ball/icon using speed and timing, getting above the line on the screen. Each time you get above the line you earn 1 point (more with multipliers; more on this in a minute). 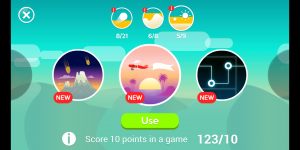 Your goal is to score as many points as possible. Your game ends when you crash (my term here) hard; meaning you either manually dive into the front face of a hill, or you hit the aforementioned front face while in a turbo mode (again, more on this very shortly). Once you crash, you start over….simple. There are a few ways to score more points. The first is making smooth landings on the backside, by way of timing your dives correctly. This can give you a 2x or 4x multiplier on your next time over the line, though at the cost of going “turbo” and launching you higher. 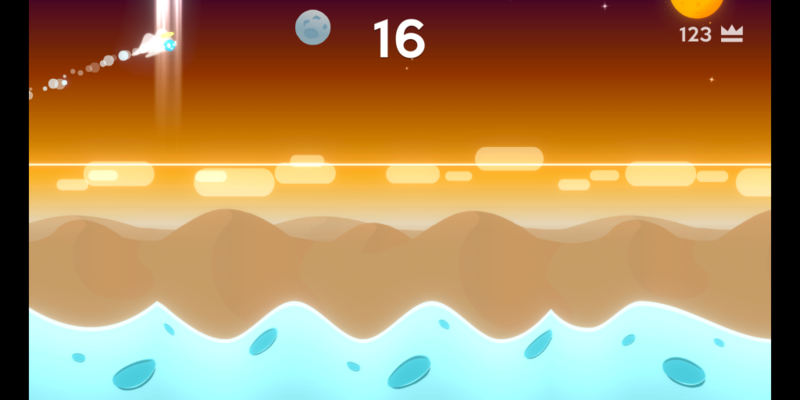 Another way to add to your score is getting really big air. 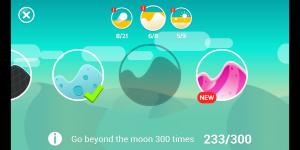 The moon is shown way up there, and every time you can get that high, you are immediately awarded 4 points. 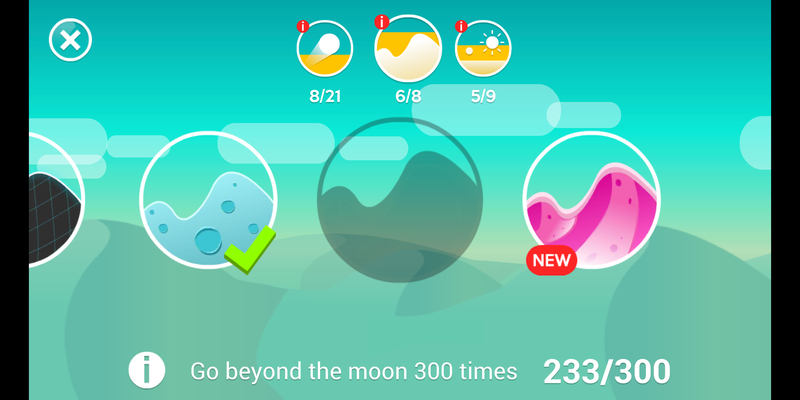 Also, going above the moon (“and beyond!”, as the game goes) means an additional 8 points. Again, this adds some risk, as it makes it a lot tougher to land without crashing. So you’re left to balance the quick point of big-air with the risk of an early game over. You can choose your strategy to implement; and it seems, at least in our house, that opinions definitely vary. My boys could not get over trying to top their record scores (and each others’). Even I got caught up into it and it quickly turned into a daily challenge and trash-talk subject. The visuals in Dune! are very clean and fun; bright but not distracting. Gameplay visuals are generally smooth, though I did encounter a bit of stutter sometimes (playing on a 2017 LG G6). Sound is…..nothing. Literally nothing, as there isn’t any sound. Just a choice to have vibrate on or off, for when you get a turbo or crash. Again settings amount to turning vibrate on & off, so that’s that. The game does allow for a decent amount of customization. 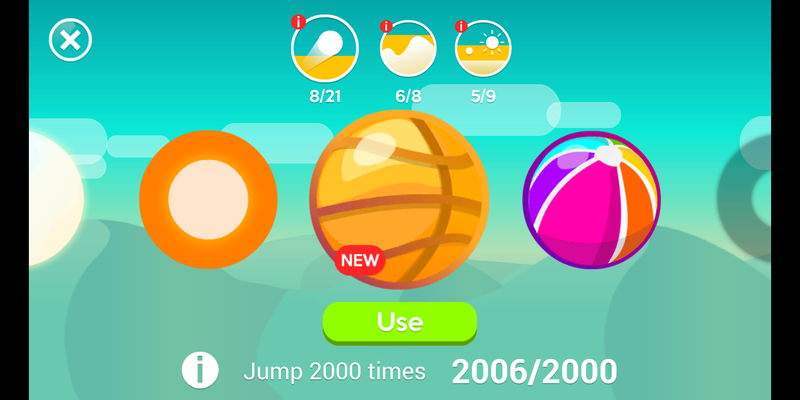 By way of accumulating playtime experience, you gain access to different balls/icons to fling into the air (by simply playing more and making more jumps), different ramp/foreground themes (by way of different jumping & landing quantities and qualities), and background themes (also by way of different quantity & quality challenges). Overall I highly, highly recommend Dune! as your next game option on your device. It provides quick & fun gameplay, without any commitment needed by you. Download Dune! 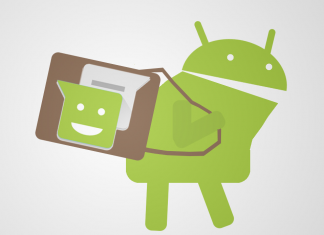 from Google Play here. Dune! 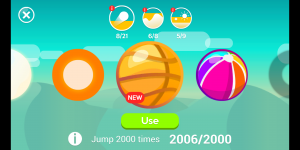 is a rare simple, casual mobile game that provides both a high-quality gameplay experience and replay-ability that is rare in the Google Play market.